DES MOINES – An image captured on a trail camera in Clinton County during the past week has been confirmed as a mountain lion by wildlife biologists from the Iowa Department of Natural Resources. “We want the public to know that we have a confirmed photo of a mountain lion, but we don’t want to alarm the public,” said Vince Evelsizer, a DNR wildlife biologist. “When it comes to mountain lions, Iowa tends to be a place to pass through, but not to stay. It is very likely this animal will keep moving, if it’s even still in the area, and will keep to itself,” Evelsizer said. The photo was taken from a wooded area along the Wapsipinicon River in the eastern part of Clinton County. DNR conservation officers were able to confirm the location where the photo was taken by matching the surrounding landscape to what is shown in the photo. The mountain lion is likely a young male that has been pushed from its native area by older, dominant males. The lion likely came from a state west of Iowa and the fact that is already on Iowa’s far eastern border suggests that it will likely continue to wander. Mountain lions have the ability to move several hundred miles in a short period of time, said Evelsizer. While the DNR gets many reports each year of mountain lion sightings, only a very small percentage are ever confirmed by the department. Most sightings are mistaken identity with other animals such as bobcats or yellow coated dogs. “But in this case, we’ve got a pretty good image from the trail camera. I don’t have any doubt on this one that we have an image of a mountain lion,” said Evelsizer. In the past 150 years, only 19 U.S. human fatalities have occurred from mountain lion attacks. Fortunately, none have occurred in Iowa. Generally a mountain lion will sense human presence before humans know they are in the area and the mountain lions will quickly vacate the area. · DON’T RUN! Running will stimulate certain animals to chase you (like a dog that wants to bite you, especially if you run). · Stand tall, look big, puff up, lift your coat over your shoulders. · Take control of the situation. Scream loudly, throw objects. · Gather children in close and slowly back away keeping your eye of the animal. · If attacked, fight back vigorously with sharp objects and poke the eyes of the animal. Scouting, both as a Cub Scout and a Boy Scout, where I achieved the rank of Star, taught me a lot and provided many wonderful experiences. These days it’s known as the Wapsi River Environmental Education Center, a 225-acre area near Dixon, Iowa, that’s managed and operated by the conservation boards of Scott and Clinton counties. And it’s a wonderful place. But I’ll always think of it as Camp Minneyata, a former Boy Scouts of America camp along the Wapsi River. 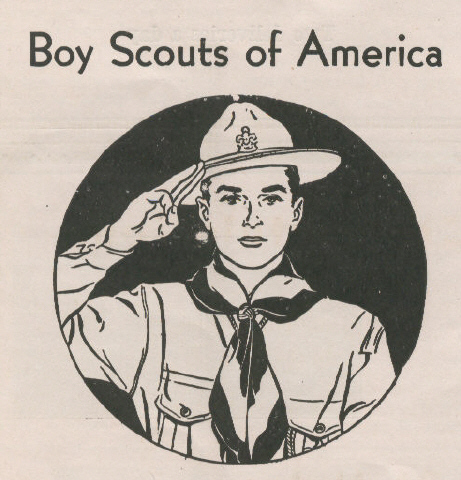 When I was a scout at Troop 53 at Wilson School in Davenport, Iowa, in the 1960s, I was fortunate to get to attend several week-long summer camps at Minneyata. We slept in tents in camps located in the clearings in the woods. Each troop had its own camp; one I remember staying at was called the Eagle’s Nest. We ate in a large dining hall, hiked in the woods and along the river, visited the trading post, swam in the camp pool and learned things like archery and riflery. All the troops gathered at night and sat on logs ringing a campfire, where we sang songs and heard tall tales like the legend of Wapsi Willie. * As much as I enjoyed them, I was always homesick during the week-long camps. Families were permitted to visit one night per week, and I’d get a lump in my throat when Mom, Dad and my brother Bruce would depart after a visit. As I recall, Bruce cried, which made it worse. One year I received a letter from my dad while at camp. That meant a lot. * The most homesick I ever got, though, was the year that Dad had to pick me up one day in the middle of the week, take me to Davenport for a TB shot, then return me to camp. I didn’t want to go back. The reason for the shot? Our family had attended a wedding reception at a neighbor’s house a week or two earlier, and someone at the reception had come down later with TB. * When you sat at the end of the table in the dining hall, there was no need to ask someone to pass the Kool-Aid or the potatoes to you so you could get a refill. As the items came toward you, everyone helped himself to seconds as he passed them on. Then, when the containers got to you, they were empty. * One year at Minneyata, word got out that camp officials had found a timber rattlesnake in the archery area. Timber rattlers are found, herpnet.net/Iowa says, “throughout most of the southeastern United States and ranges northward from Iowa into Minnesota and Wisconsin via a narrow band along the Mississippi River. In Iowa, they are found along the Mississippi River and in various areas in the southern third of the state.” I reasoned if there was one rattlesnake at Camp Minneyata that year, there were probably dozens of them. We slept two boys per tent in sleeping bags on metal cots placed on wooden pallets. I spent some sleepless hours for the next few nights, sure that there were rattlers under my pallet waiting to get me when I drifted off to sleep. * One morning at camp, many of us woke up with our lips burning. Someone had ringed our mouths with toothpaste overnight as we slept. We must have been quite a sight. * One scout, Don, was a bit more advanced than the rest of us. He had a black market operation that he ran out of the back of his tent. He sold items like candy bars and bottles of Pepsi at highly inflated prices to the rest of us. One night, though, troop leaders put an end to it. Don had his own campfire behind his tent, and that night he was heating up a can of soup as a bedtime snack. But he had neglected to punch a hole in the can, and it exploded. When we all ran behind Don’s tent to see what had made the popping sound, he had a look of shock on his face. The back of his tent was wet with soup broth, and noodles were sliding down the canvas. Noodles also hung from nearby tree branches. By the way, Don is now a successful Davenport businessman. 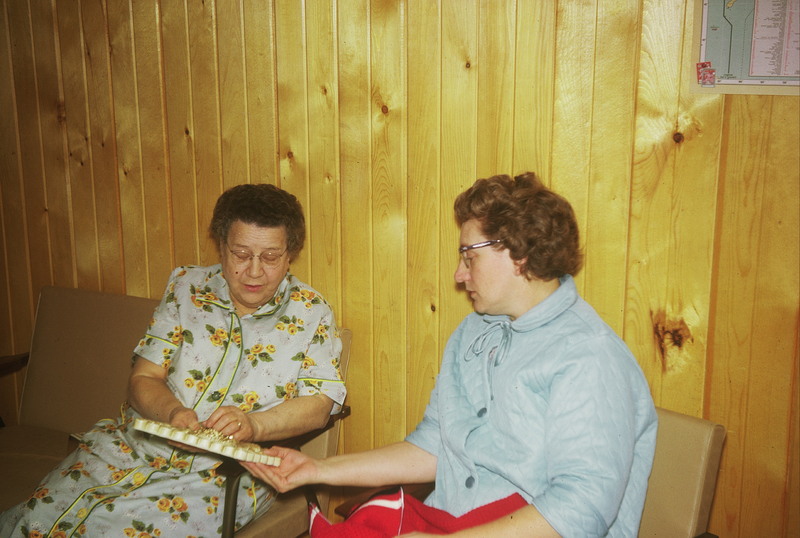 Grace, left, and Dorothy Roberts at Christmas in 1963. Phil Roberts photo. I can remember some funny things about my paternal grandmother, Grace Roberts. One story she related to us dealt with a tube of a pain-relieving ointment like Deep Heat or Infrarub. Grandma must not have had her glasses on one morning when she was preparing to brush her teeth. That’s because she mistakenly put a dab of the ointment instead of toothpaste on her toothbrush and began — but certainly didn’t finish — brushing her teeth. Another funny incident occurred when grandma was visiting us on Dugan Court. It involved our pet Chihuahua, Tippy, whose tail was always straight in the air. Grandma always wore dresses and never slacks. Once either my brother or I had spotted a garter snake on the west side of the house and told mom. We probably reported the sighting instead of just walking away because Dad hated snakes and insisted on killing any that were found on our property. This sighting, however, came while dad was at work. So we told mom. Mom, Grandma and Tippy came outside for a look at the snake. But, by the time they arrived, the serpent was nowhere to be seen. Perhaps he had gone into a hole in the ground. Anyway, Mom and Grandma were bent over, studying the ground next to the foundation, looking for the snake, when Tippy walked up behind them. His tail brushed the back of Grandma’s bare leg and you can guess the rest. Grandma Roberts nearly jumped out of her skin! 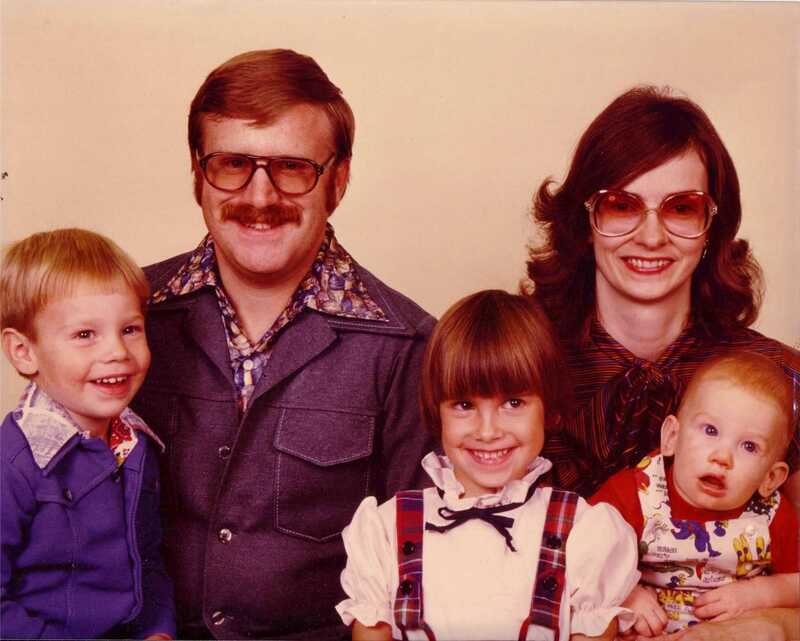 Church directory photo from October 1978. Tonight, Sherry and I go to church to have a portrait shot for a new church directory. And I’m really not looking forward to it. For our donation of time we get an 8×10 print of the portrait we select and a copy of the directory when it’s printed. I suggested to Sherry that we instruct them just to use the photo taken last time, probably six or seven years ago. That won’t work, she said. She said we don’t look like that anymore. It seems our hair has lightened up since then. 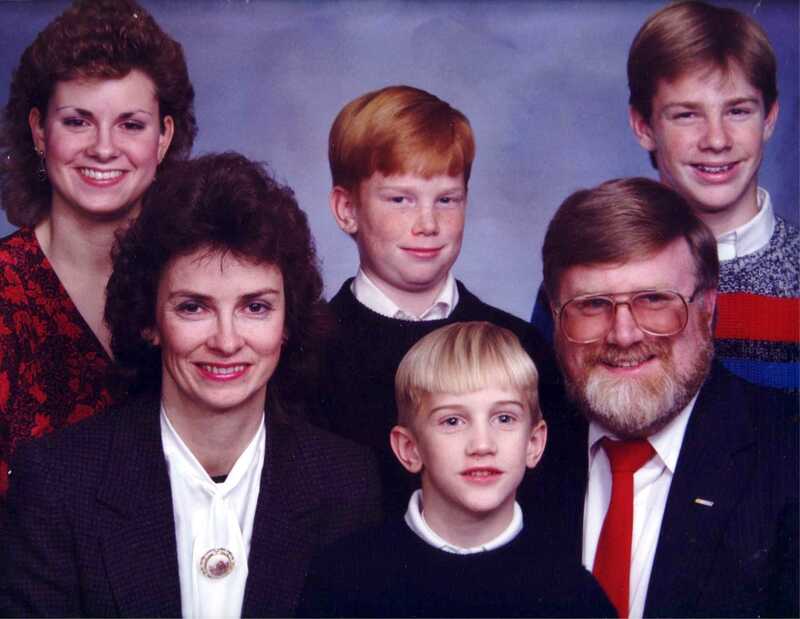 Years ago, when we were raising four children and trying to pay the bills on one income so Sherry could remain a stay-at-home mom, we looked forward to the directory photos. They provided us a free family portrait we could not otherwise afford. And we scrimped and bought some extra photos for the grandparents. Those days are gone. The kids have grown up and moved out. We now have some money for discretionary spending. And the grandparents are deceased. So I’m really not looking forward to going tonight. One thing is good. I’m dressing in comfortable clothing this time. Years ago, they suggested men wear sport jackets, dress shirts and a tie. But society, including me, is much less formal in 2011. It is suggested we dress in clothing we are comfortable in. Now for me, that would be coach’s shorts and a colored T-shirt with writing on it in the warm weather months and sweatpants and a long-sleeve, colored T-shirt in the cool weather months. But I know that won’t fly with management, so instead I’ll wear khaki slacks and a sport shirt, open at the collar. No tie. And no sport jacket, thank you. My wife, who obviously has more class than me, is wearing a dress. The thought of church directory pictures does bring one smile to mind. 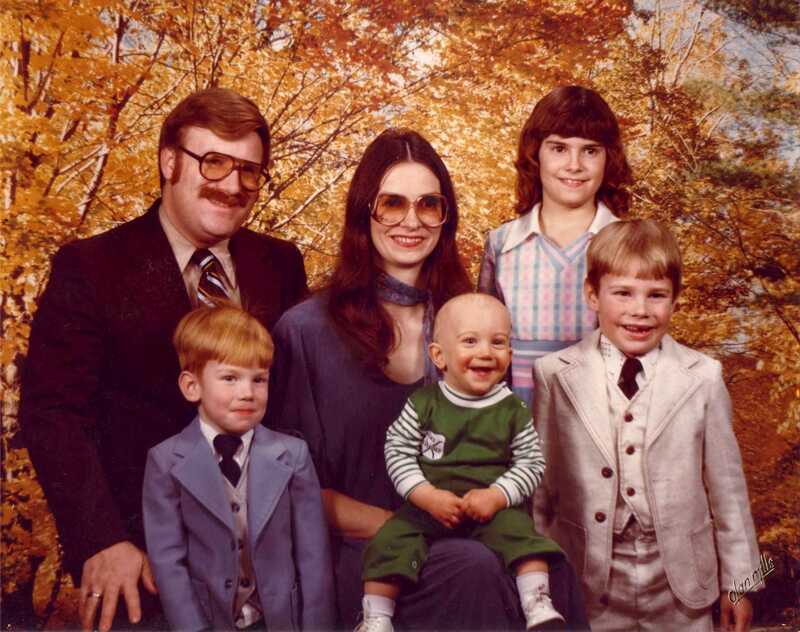 It was in the early 1980s and our family portrait appointment for the church directory was the evening of the day I’d had a vasectomy. I was in lots of pain. In addition to chairs, the photographer had boxes of various heights in his makeshift studio used to pose everyone just right in the photo. He also had a round stool. My wife and I shot quick glances at one another, and I sat down. I still remember the pain from doing so. If I smiled in that portrait, it was certainly a forced smile. The Miller house on Union Street. When I was a youngster, I thought it was a mansion. Phil Roberts 2011 photo. Grandpa’s shed, always a mysterious place to me. 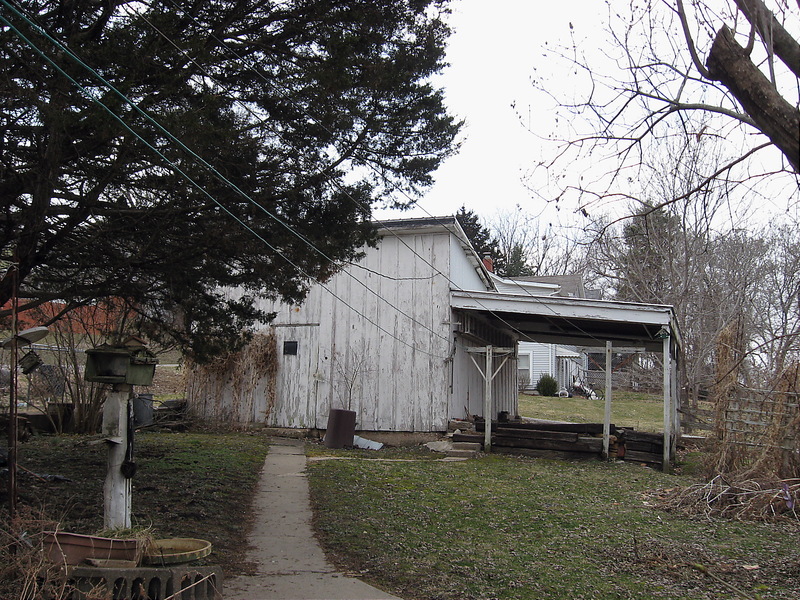 The carport was added by my late Uncle Jake. Phil Roberts 2011 photo. This photo of a photo is how I remember my grandparents. Phil Roberts 2011 photo. My aunt, Doris Schnetzer, holds a photo of her late husband Jake. Phil Roberts 2011 photo. 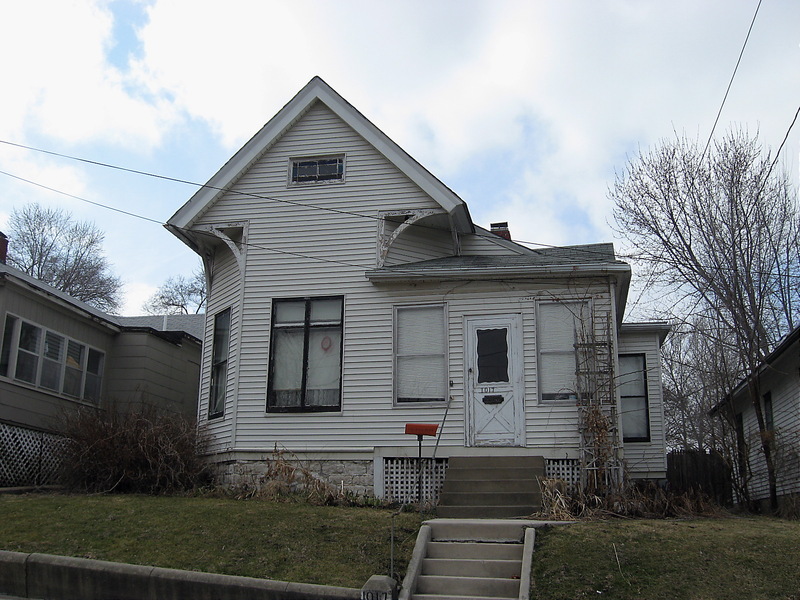 I well remember my childhood visits to Grandma and Grandpa Miller’s house at 1017 Union Street in Hannibal, Mo. We spent some days with my mother’s parents during our two or three visits each year. There were times they’d visit us, too. They’d take the train from Hannibal to Galesburg, and we’d pick them up there and bring them the rest of the way. To look at it their house today, it’s just an old white house on a terrace in an aging neighborhood. But back then, to my young eyes, it was a stately mansion sitting proudly atop a hill. My brother and I would swing for hours in the swing on the screened-in front porch. We didn’t have one of those at home. Grandpa, Benjamin Thomas Miller, a retired railroad man, would get on us mildly when we’d get too aggressive while swinging and bump the railing behind the swing. I’d play with my diecast metal toy cars, made by Tootsietoy, on the hilly terrain. Sometimes my brother and I, my dad and I, or all three of us, would play catch in the back yard. Grandpa Ben had a huge shed in the back yard. It had a dirt floor and was dark and musty smelling. Grandpa was a saver, and I always wanted to explore his shed, seeing what treasures I could find in it. But when he went inside to get something and I’d follow, he’d never let me stray too far. I always wondered why. Sometimes during our Union Street stays, I’d visit Nellie Fisher, the widow woman who lived next door to my grandparents on the downhill side. She was a nice old lady and, I guess, lonely. Sometimes, when I was in my early teens, she’d invite me inside for tea. We’d sit in her living room drinking hot tea and chatting, and I felt like a grownup. The only time I remember drinking hot tea at home was when I was sick. My brother and I would also play with some neighbor kids, the Bozarths, who lived two doors down from our grandparents, next to Mrs. Fisher. Keith was about my age, and I had a crush on his older sister, Linda. I think they had an older brother, and there was a younger brother Bruce’s age. It was on Bozarth’s front steps that I learned from Linda how to play rock school, something I later taught my daughter Andrea’s children. I’d also play with “Skippy” Webster when in Hannibal. He was a tall kid who lived across the alley from the Millers and was so skinny he had to hold his jeans up with suspenders. As I recall, Skippy; his mother, the former Kathryn Saunders; and his father Charlie; lived with Kathryn’s mother or grandmother. Skippy was an only child and had some really neat toys. But we’d have to be fairly quiet around his place during the day because his dad, who became somewhat a legend in later years around Hannibal, was a policeman who worked nights and slept days. One of the fun things about a visit to Union Street was going shopping with my Aunt Doris, who was unmarried for most of her life and lived with her parents. We’d sometimes take Doris’s folding grocery cart — the Millers never owned a car to my knowledge — and head down Union Street to shop at two stores, Hy-Klas Market and Booth’s Dairy Store. Oddly enough, they sat side by side. Doris would buy some items at each business. The stores were just a stone’s throw from a single-bay firehouse on the corner at the foot of Union Street. It housed one open-air, 1920s pumper that I think seldom left the station. On warm summer nights when we’d drive by, several firefighters would be sitting outside the station in wooden chairs, hiked up in front and leaning against the brick building, chatting. My grandma, Minnie Francis Miller, loved plants and flowers and her house and its yard were full of them. Her house also was full of what-nots. She always wore flower-print dresses and often an apron. Grandma was friendly and kind and smiled a lot. She wasn’t loud or demonstrative despite have raised half a dozen kids, often alone, because her husband was gone a lot with this job on the railroad. I remember one story from my grandmother’s childhood. She said she had to walk through some woods to get to school. Her family was poor, and she didn’t have shoes. Once in a while her bare feet would come down on a snake as she went to school, and she’d just step a little higher and faster. My grandfather was a tall man with thick, white hair, a sense of humor — he liked to tease — a big belly and thick glasses. 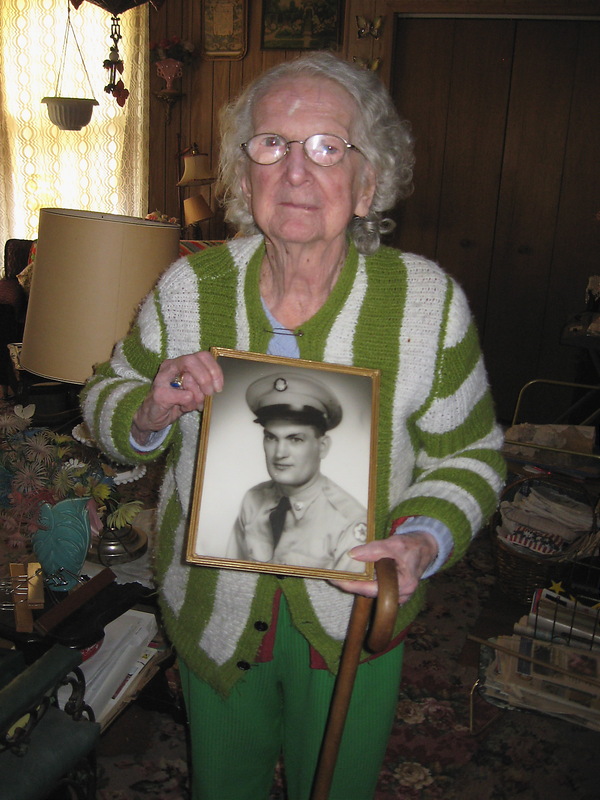 He wore longsleeve denim shirts year-round and held his trousers up with suspenders. He always carried a pocketknife in his pants pocket and always had a pencil or two in the pocket of his shirt. Thanks to cataract surgery, Grandpa’s eyes were quite sensitive to light. So he often wore clip-on sunglasses, even in the house. And his straw hat had a green eyeshade in the front part of the brim. By the time I remember Grandpa Ben, he was getting up in years and not too steady on his feet anymore. Once they joked how he had fallen in his sitting room because, when he had gotten out of his rocker and tried to walk, he’d forgotten his legs had been crossed and his feet got tangled up. Grandpa’s mind was sharp, and he’d sometimes share stories about his years of working on the railroad, where he’d started as a teenage waterboy on a section gang and ended up a passenger train conductor. I wish I could remember more stories, but only two come to mind. One is about a train Grandpa was on going up a steep hill when two of the cars became uncoupled, sending the back half of the train back down the hill, out of control. I can’t remember whether or not it derailed. The other story was about a real hot day on a passenger train. When the train pulled into a station, one of the passengers, a man, saw a bucket of water on the dock. He was so hot, he stuck his head into it, and died instantly. Grandpa had one thing in life that really bothered him — that was dogs running loose in the neighborhood. Hannibal apparently didn’t have a leash law in the ’60s, and Grandpa Ben was tired of big dogs leaving piles of poop in his yard. The dogs wouldn’t depart when Grandpa yelled at them, and he was in no shape to chase them. So he gathered some good-sized rocks on his front porch railing by the screen door. And he would throw one occassionally to get a pooping dog’s attention. It was a good plan until one of his rocks hit a car passing by, and the angry driver stopped. The rock-throwing also stopped. Breakfast was always a big affair at the Miller house, supposedly because Grandma, who had diabetes, had to eat well. There were always fried eggs, bacon, toast, oatmeal and cold cereal on the table. Grandpa sat at the head of the table, and it was his job — exclusively — to operate the toaster. He took that task very seriously, and none of us ever challenged him on it. He also taught me about the “swattermock,” something I passed onto my grandchildren. The basement of the Miller house had been dug out after the house was built and was a dark, dank, musty place. I’d only be permitted down the narrow, winding basement stairs on laundry day to watch the action. The basement had a large, open sump hole, and Grandpa was afraid I’d fall into it and drown. So he’d tell me, and presumably other children, that a monster — a swattermock — lived in the water-filled hole, so I’d best stay clear of it, or the swattermock would get me. His plan worked. I never fell into the water with the swattermock. One thing my grandfather taught me that I will always remember is a nursery rhyme he had learned as a child. I tried to get my grandchildren to memorize it, too. I have in recent times found numerous variations of this rhyme — one uses the word Nicholas instead of nickwish — on page 95 of the public domain book, “The Counting-out Rhymes of Children, Their Antiquity, Origin, and Wide Distribution, a Study in Folk-Lore,” by Henry Carrington Bolton, D. Appleton and Co., New York, 1888. The book has been digitalized by Google. The only bad part of a visit to the Millers was trying to sleep there on a hot summer night. Their house wasn’t air conditioned, and they had few fans. There were two bedrooms. Grandma and Grandpa slept in the back bedroom. Mom and Dad got the front bedroom off the sitting room, where Bruce and I slept on a hideabed. Doris slept on a sofa in the formal living room. The Millers went to bed early — always before the town’s sirens wailed at 10 p.m., signaling curfew time for juveniles. And I spent a lot of time tossing and turning in sheets made wet with sweat. I’d often hear the Miller’s mantle clock in the dining room, which chimed every 15 minutes, for an hour or more before I’d drift off to sleep. Using the bathroom there at night was awkward, too. Holding just a toilet and a clawfoot tub and no sink, the small room apparently was added off Grandma and Grandpa’s bedroom after the house had been built. One had to tiptoe past their bed on creaky floors to use the toilet. Here are some other memories of the Millers. I remember using their phone before it had a dial. All of the calls were completed by the operator. Once, I was permitted to call my Aunt Louise, whose number was 3868. I picked up the receiver and a woman operator said, “Number pulleeese.” I said 3-8-6-8 and was soon speaking to my aunt. I don’t remember the Miller’s number in the pre-dial days, but my Grandma Roberts’s number was 27W. When the community went to dial phones, Aunt Louise’s number became Academy 1 (or AC1) 3868. Grandma Roberts’ became AC1-0027. Eventually Academy 1 was referred to merely as 221. It was at the Miller house that I first saw my dad cry. It was probably in the early ’60s and Dad had received a call notifying him that his boss, Keith Hunter, had died of a heart attack. Hunter was a tough boss but Dad learned a lot from him and respected him. I believe it was after lunch that the family was gathered in the kitchen and dining room but I noticed that my dad was missing. I found him in the sitting room lying face down on the sofa, sobbing. I didn’t know what to do, so I quietly walked away. That made a lasting impression on me. According to the Internet, the program debuted in 1957 and lasted 12 seasons. If you phoned while Grandma was watching one of her programs, you were out of luck. She wouldn’t answer. 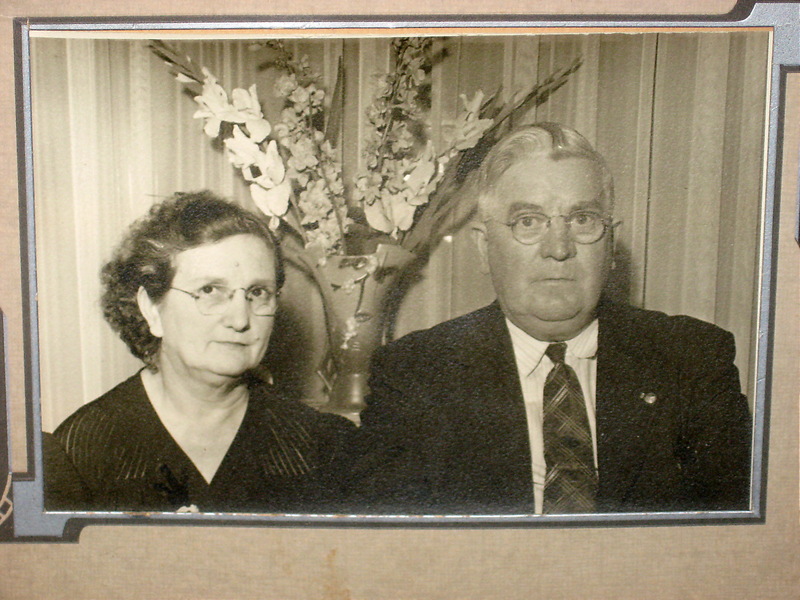 Tags: Benjamin and Minnie Miller, Hannibal, Mo. I once turned my back on a ram — his name was Joe — in my father-in-law’s farm field after he had tamely let me pet him for a few minutes. But once a ram, always a ram. Joe head-butted me. Hit me from behind as I was walking away, thinking we were buddies. It was a shock. I flew through the air, landing on the ground. It knocked the wind out of me. I had flashbacks of high school football practice. When I recovered and got up, Joe was standing nearby looking at me, like nothing had ever happened. I left the field, walking backwards this time, facing Joe. I never petted him again. I guess I took it personal. A surprise for Krista Voda from Joe Taylor of the QCSC. 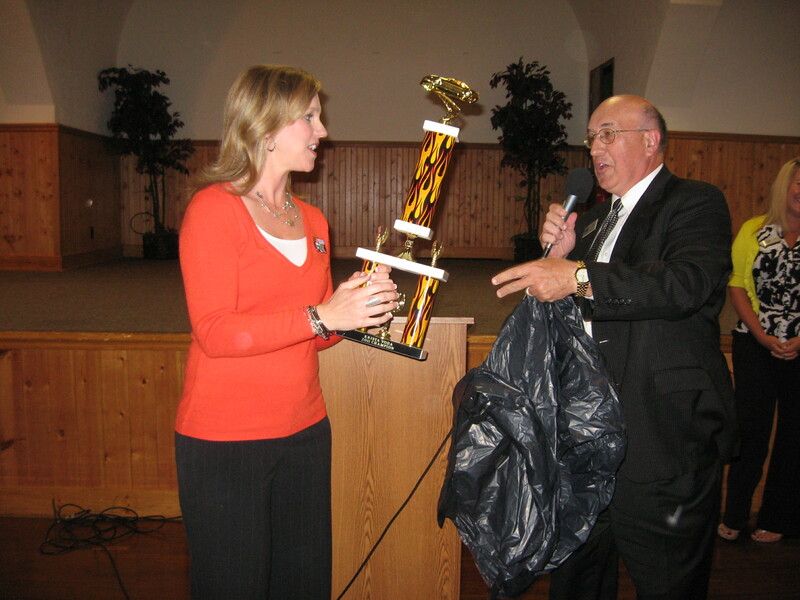 As seen in the first two photos above, Joe Taylor of the Quad Cities Sports Commission surprised Clinton, Iowa, native Krista Voda with an award today (Sept. 13, 2011) at a luncheon celebrating the 15th anniversary of the commission. 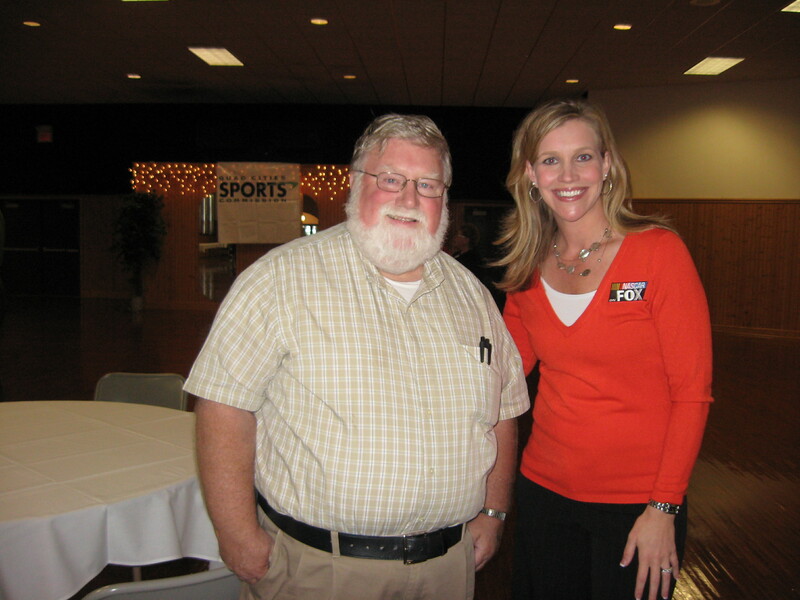 Krista was the keynote speaker at the luncheon, held at the Mississippi Valley Fairgrounds’ Starlite Ballroom in Davenport. Krista has covered racing extensively for cable TV’s Speed channel and has worked as a pit reporter for NASCAR races seen on FOX and FX. She also has done sidelines reporting from televised football games. From humble beginnings in local broadcasting, she became the first woman to host a NASCAR pre-race show on television and, earlier this year, was named one of the Top 10 most influential women in NASCAR. She spoke about her rise to national TV prominence and shared some interesting behind-the-scenes stories from her work. 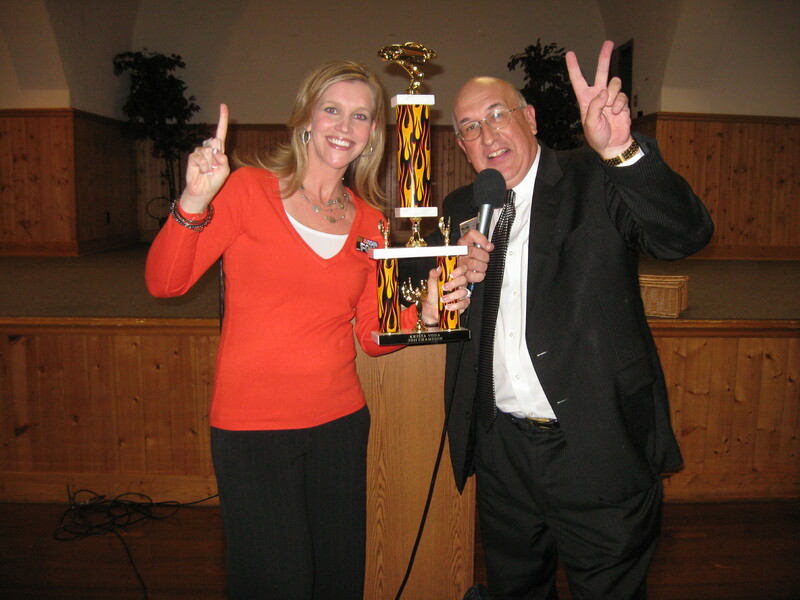 Taylor noted that Voda has likely presented her share of trophies the last few years but probably has not received any. So the commission remedied that. I am shown with Krista in the third photo.